Element Battleground is a small, quick card game that puts you in a battle of wits with your opponent as you battle with the powers of the elements in your hands. Read the rules here, then print and play the game from the links below! You only need to print 10 cards to start playing! Each player draws one Element card per turn and sets it face up in front of them. The players take a minute to explain and understand their card and their opponent’s card. An Element card explains that element’s power for each of the three Battle Tactics: Positive, Negative, and Neutral. Every element is different and benefits from attacking with their Battle Tactics in a different order. Each player always has one of each Battle Tactic card. These are used to plan for the battle. A battle consists of choosing the order you will use your Battle Tactics. To prepare for battle, each player sets their Battle Tactic cards facedown in front of them in the order they choose. 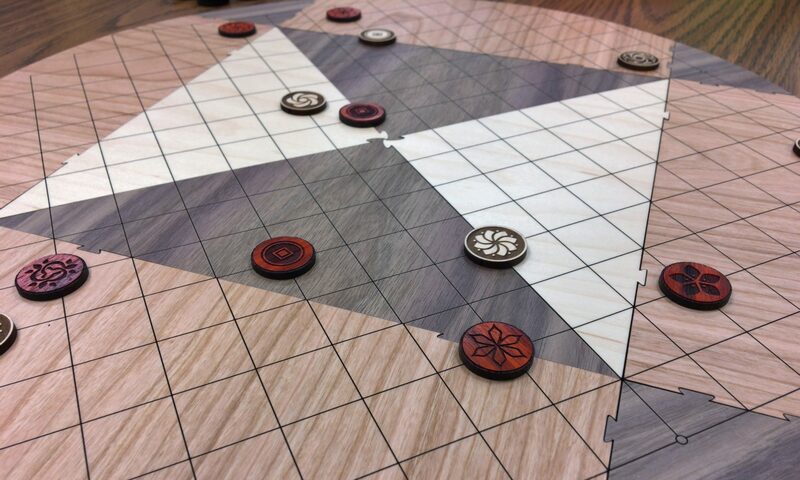 Then, players reveal their Battle Tactics one by one and apply each player’s move in battle simultaneously. The player who takes the most damage is defeated, and the winner gets a point! Let’s look at an example battle to help you see how the game is played. Both players look at their elements to understand how each player might battle. Player 1: Fire will benefit from attacking with Positive energy sooner in battle rather than later. Player 2: Earth will benefit from an early Neutral energy and waiting to attack with Positive. Battle Turn 1: Fire plays Neutral, which has an effect on the next turn’s outcome. Earth plays Neutral, which powers up its Negative Tactic when that is played. No damage is dealt this turn. Battle Turn 2: Fire plays Positive, which threatens to do 1 damage, plus the additional 1 damage granted by playing Neutral in the previous turn. Earth plays Negative, which blocks all damage due to playing Neutral in the previous turn. No damage is dealt this turn. Battle Turn 3: Fire plays Negative, which blocks 1 damage. Earth plays Positive, which threatens to deal 2 damage. Fire blocks 1 and takes 1 damage this turn. The battle ends with Fire having 1 damage and Earth having 0, so Earth wins this one and Fire is down for the count! Player 1 discards the Fire element card and draws a new one for the next battle. If the battle is a tie, redo the battle until there is a winner or there have been three ties in a row. In that case, discard both elements or shuffle them into the remaining element card pile, then each player draws an element card for the next battle. In the battle after a tie, neither player is allowed to play the same exact order of battle cards as the previous turn. Just print the Element Cards and the Battle Cards to play the game now! To get started, play with only the Fire, Earth, Water, and Air element cards in the game, then add the more advanced cards later. Also, I recommend printing the pages at 75% size to get good card-sized prints.